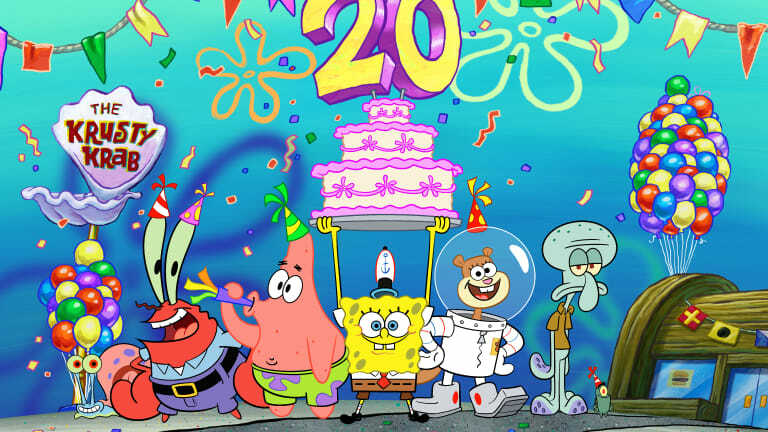 SpongeBob SquarePants is a household favorite and believe it or not, Nickelodeon is commemorating 20 years of SpongeBob SquarePants! Launched July 17, 1999, it has reigned as the number-one kids’ animated series on TV for the last 17 years, generating a universe of beloved characters, pop culture catchphrases and memes, theatrical releases, consumer products, a Tony award-winning Broadway musical and a global fan base. In honor of the anniversary, the “Best Year Ever” kicks off Friday, July 12th, with the premiere of “SpongeBob’s Big Birthday Blowout,” an original mixed live-action and animated special, and leads up to the Paramount Pictures and Nickelodeon Movies theatrical, The SpongeBob Movie: It&apos;s a Wonderful Sponge, coming summer 2020. Nickelodeon will also commemorate the series with: a new product line by master toy partner Alpha Group, featuring figures that showcase SpongeBob’s iconic meme moments; collaborations with lifestyle brand Cynthia Rowley for a SpongeBob wetsuit and international mixed-media artistRomero Britto; the launch of a dedicated YouTube channel and mobile game; and more.